Troubled with your dry and frizzy hair? Tried various shampoos and conditioners to tame your hair but failed? Nothing to worry, as we have the best solution for you to try out. Bad hair is a common problem that every girl complains. It is revealed that lack of nourishment and strength in your hair roots is the prime cause that results in tangled and untamable tresses. Using hair masks and conditioners can help smoothen and repair the hair successfully. For maximum benefit, always try to go for the natural conditioning ingredients instead of the chemically treated products. Feeling watery mouth thinking about the creamy flavored mayonnaise? Your favorite ingredient in sandwiches and pizzas can also be your most prominent item in hair treatment process. Ever thought of it? Here we give you an overview about the benefits of using mayonnaise in making your tresses look smooth, soft, shiny and lustrous within few days. Just try it twice every week and you will definitely love to watch your hair get repaired and moisturized perfectly. Mayonnaise is full of various essential oils that are extremely good for hair growth and repair. It not only adds moisturizer to the hair but also removes the dullness completely, thus adding a shine to your curls. Its high protein content strengthens the hair roots and prevents easy breakage. Moreover, deep conditioning with mayonnaise and egg gives new growth to hair follicles, making your mane look fuller and fascinating. 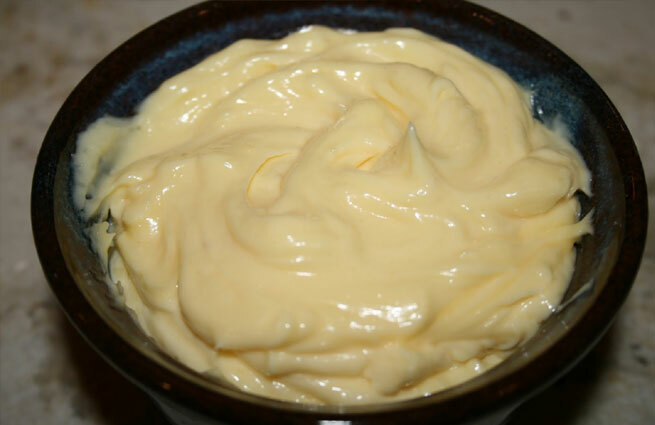 Mayonnaise is suitable for all types of hair and can be used regularly without any fear. For seasonal hair damage and roughness also, this makes for an amazing solution at hand. Forget about spending a fortune at the beauty salon and bank on mayonnaise to restore your hair’s health and growth in a positive way. It is not only pocket friendly but also works wonder without any side effects. Purchase some good quality mayonnaise from your local market or grocery store. No need to worry about its fat content as it’s meant for your hair and not body. Use some lukewarm water on the hair and get it damp. Make sure you do not soak or wash your hair completely with water. Now take some mayonnaise on your hand in accordance to the length and size of your hair and rub it thoroughly. Wrap a plastic bag or shower cap on your head to hold the heat for some time. Keep it this way for 15-20 minutes and then wash off with a mild shampoo. Mayonnaise hair treatment is extremely easy and loaded with multiple benefits. You can even add other ingredients to the mayonnaise such as almond oil, eggs, olive oil, vinegar and more to make it extra effective.